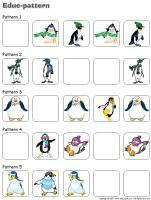 (Open thematic poster-Penguins) Print, laminate, and decorate the walls of your daycare with all kinds of posters. 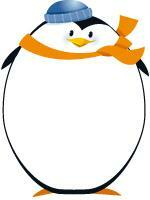 (Open educa-decorate-Penguins) Print, cut out, and laminate the illustrations. Use them to decorate the walls of your daycare and to set the tone for your theme. Transform your daycare by depositing white bed sheets or cotton batting on the floor. Children will love sitting and playing on the "snow". This special tool was created in response to a special request received. (Open name tags-Penguins) Print and display. Collect pictures or figurines representing polar animals. Deposit all the items in the centre of your circle. Randomly select an object and have children share what they know about it. You may also use books to spark a discussion with your group. With children, identify the animals which live at the North Pole permanently and the animals which migrate to the North Pole. During your discussion, invite children to take turns walking around your circle time area like a penguin. The pictures may be used as a memory game or to spark a conversation with your group. Use them to decorate your daycare or a specific thematic corner. 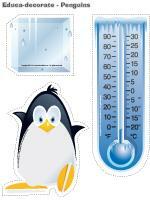 (Open picture game-Penguins) Print, laminate, and store in a Ziploc bag or in your thematic bin. 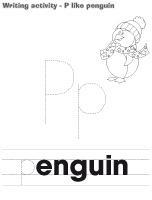 (Open writing activities-P like penguin) Print for each child or laminate for use with a dry-erase marker. (Open stationery-Penguins) Print. Use the stationery to communicate with parents, in your writing area, or to identify your thematic bins. 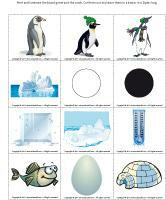 (Open activity sheets-Polar animals) Print and laminate. Encourage children to connect the dots from 1 to 10 using a dry-erase marker. (Open observation sheet-Number 5) Print for each child or laminate for use with a dry-erase marker. (Open word flashcards-Penguins) Use the word flashcards to spark a conversation with your group, in your reading and writing area, or to identify you thematic bins. Emperor penguin, king penguin, iceberg, ice, fish, egg, black, white, ice floe, cold, penguin, igloo. (Open felt board game-Polar animals) Print. Glue four pieces of white felt on a large piece of cardboard and display your felt board on a wall. With children's help, trace the polar animal shapes on colourful pieces of felt and cut them out. The shapes will stick on your felt board. Children can use them to create a variety of scenes. Children turn their feet outwards to walk like penguins. This will make routines and transitions fun. Have fun making penguin sounds with little ones. You may try other animal sounds while you are at it too. This is an excellent exercise to promote language and motivity with young children. Fill a basket or large container with colourful feathers. Let children manipulate and observe them. You may also use the feathers to tickle little ones. Hang a winter-themed mobile over your changing table. Little ones will admire it during diaper changes. 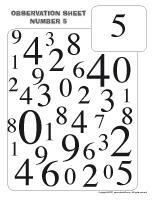 (Open perpetual calendar-Black and white day) Print and display. Arrival: Children arrive dressed in black and/or white. Wear a white (Santa Claus) or black (witch) wig to greet them. Circle time: Paint each child's face using black and white makeup so they look like penguins. Lunch: Play a simple guessing game with your group. Deposit your salt and pepper shakers on the table and invite children to guess which is which. Ask children to identify black and white foods. Special activities: Identify all the black and white items which can be found in the daycare. Mix black and white paint. Draw on black construction paper using white chalk. Explain how penguins carry their babies on their feet to keep them warm. Purchase a plush penguin. Children can try to carry the penguin on their feet. See who can carry it the farthest. Divide your group into two teams. The teams stand, facing each other, on two lines. Give a ball to each child in the first team. They must squeeze the ball between their knees and walk like penguins towards the child standing in front of them from the opposite team. Once they reach the other child, they must give their ball to the other "penguin" without dropping it. The second child must waddle back to the start with the ball between his knees. Cut patches of ice out of light blue construction paper. Secure them on the floor. Glue a fish shape on a bean bag. Children must toss the fish on the patches of ice and then hop on them like a penguin would do to catch the fish. (Open lacing-Penguin) Print, laminate, and punch holes around the contour of the shape. Children may use a string or ribbon to lace. Select a child who will be the penguin. The penguin chases the other children. When he touches a child, the other child becomes the penguin. Variation: When the penguin touches a child, the child must stand still with his legs spread out. He may resume running if another child crawls between his legs. Where are the penguins hiding? (Penguin figurines) Print. Hide hundreds of penguins among the toys. Each time a child finds a penguin, he must say, "I found a penguin!" Collect the penguins and hide them over and over again. Create an obstacle course and display penguin pictures throughout. Children must avoid or capture the penguins, depending on the instructions you give them. This activity can also be done outside. Penguins walk with their arms along their sides and with their feet pointing outwards like a "V". Encourage children to look closely at the tracks they see in the snow. Invite them to walk like penguins and look at their tracks. Have them make tiny tracks and huge tracks. Ask them which animals make small tracks (mice) and which animals make large (bears) tracks. Play fast-paced music and ask each child to invent an original penguin dance. When they are ready, they can present their penguin dance to their friends. Children stand in line, single file. They curl up in a ball so they are as small as possible. Have them tuck their head between their knees. The child standing at the end of the line hops over the other children, one at a time. When he reaches the front of the line, he crouches down and the child who is then at the end of the line does the same thing, and so on (leapfrog). 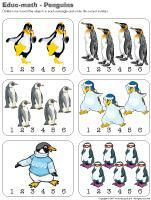 (Open educ-math-Penguins) Print and laminate for durable, eco-friendly use. Children must count the objects in each rectangle and circle the correct number. 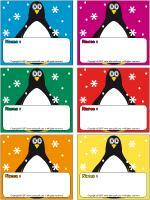 (Open educ-same and different-Penguins) Print and laminate for durable, eco-friendly use. Children must circle the illustration which is different in each row. 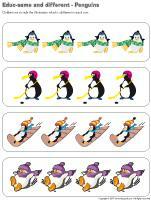 (Open magnifying glass game-Penguins) Print and laminate the cards. Children pick a card and search for the item on the board game using a magnifying glass. Once they have found the item, they deposit the card in the correct square on the board game. (Open educ-pattern-Penguins) Print and laminate. Children must place the cards in the right boxes to complete the patterns. Select a child who will play the role of the penguin. With the other children, sit in a circle around the "penguin". The "penguin" must walk from one child to another, waddling like a penguin, attempting to make them laugh. The first child to laugh becomes the next silly penguin. An emperor penguin is the tallest of all penguin species. He can be 120 cm tall. Glue a picture of a penguin on the wall, 1.2 metres from the floor. Measure each child in your group and write their name on the wall to compare their height to an emperor penguin's height. (Open penguin figurines) Print and laminate. Prepare blue Jell-O, using slightly less water than the suggested recipe, and cut it into cubes. Deposit the cubes in a few containers and add the penguin figurines. Children will enjoy making the penguins walk on the Jell-O ice cubes. Purchase two bags of ice cubes (for camping) and use them to fill a sensory bin (or in another container). Add penguin and/or polar animal figurines. Let children explore this cold texture. Fill a large container or bin with sugar, salt, flour, rice, or snow. Let children play in it with penguin or polar animal figurines. Children will love exploring these new textures. With your group, combine the following ingredients: 1 cup of water with 2 cups of cornstarch. The mixture is ready when it can easily be detached from the sides of the container. It will seem liquid, but if you hit it, it will not spatter. The mixture is liquid when it is not under pressure, yet solid when under pressure. Give a small amount of the mixture to each child. Suggest they make a tiny snowball with the magic snow. Children will quickly realize that the snowball will keep its shape when pressed and become liquid in their hand as soon as they stop manipulating it. If you are doing this activity indoors, have children manipulate the magic snow over a table. You may choose to have them wear aprons, but cornstarch does not stain. At the end of the activity, simply brush aprons and/or clothing with a clothes brush to remove any leftover cornstarch. Separate an Oreo cookie. Set the half with the cream aside. Break the other half in two to create penguin wings. Glue them on the cookie half set aside. Use a tube of icing (for cake decorating) to draw eyes and a beak on the penguin body. (Open puppets-Penguins) Print the models on heavy cardboard. Have children cut them out and decorate them with a variety of materials. Glue Popsicle sticks behind the models to create puppets. (Open craft-wiggly penguin) Print for each child. Have children color and cut out the various pieces. Assemble them using fasteners where indicated. (Open models-Penguins) Print the models in different sizes. Decorate them with glitter, lace, ribbon, cotton balls, confetti, etc. Glue them back to back on either side of ribbon or string. Hang from the ceiling. (Open mini penguin) Print, color, and cut out the pieces. Glue them on an empty toilet paper roll to create a miniature penguin. Hang from the ceiling. (Open hat-penguin) Print and cut out. Have children glue cotton balls on the hat. They can color the penguin of their choice and glue it on the front of their hat. Cut a strip of black construction paper for each child. Measure each child's head and staple or glue the strip of paper so that it fits perfectly. Use orange construction paper to make a beak and white construction paper for eyes. Glue the beak and eyes on the strip of black construction paper. (Open mandalas-Penguins) Print for each child. Invite children to color the mandalas as part of a relaxation period. Set up easels and offer paint. Encourage children to paint penguins or Arctic scenes. (Open models-Penguins) Print for each child. Cut or tear scraps of tissue paper into tiny pieces. Have children glue them on their penguin models. Let dry and display. Give each child an empty yogurt bottle (Yop). Have them glue black feathers on their bottle (or scraps of black construction paper). Add wiggly eyes and a small piece of orange construction paper to represent a beak. 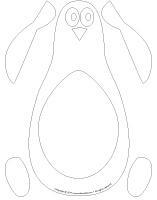 (Open coloring pages theme-Penguins) Print for each child. 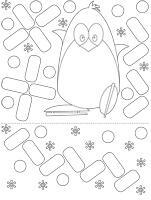 (Open creative coloring-Penguins) Print for each child.